The holiday season is reaching a crescendo! Are you busy wrapping gifts, baking cookies, hosting/attending parties, and just generally checking your to-do lists twice? My holiday is a little different this year. It feels like one or all of us have been sick since Thanksgiving though luckily, we're all on the mend and feeling much better now. Also, cooking/baking is on hiatus due to our kitchen renovation. That said...we're still keeping up our Christmas spirit! There are still goodies to eat, presents to wrap, hot chocolate to sip, and gingerbread houses to decorate. We're being a little creative making the best of things though I'm counting down to the day when I can get back in the kitchen to make things like weekend breakfast. Hopefully, it will be sooner rather than later. Before cooking halted, I whipped up a chocolate Dutch baby pancake for one of our weekend breakfasts and I wanted to share that with you now before taking a little holiday break and waiting for our kitchen to be operational again. Now, a regular Dutch baby pancake - which is like a cross between pancake, thick crepe, souffle and popover in one - is one of our family's favorite things! I make it at least twice a month for breakfast on the weekends. I've tried talking my husband into trying a savory one but he's been reluctant to change a good thing. But when I saw a chocolate version over at Mel's Kitchen Cafe, I had to try it; I mean, it's chocolate! Everyone was on board with that. I love the recipe I use to make my regular Dutch baby pancake so I actually leaned on that for this chocolate version, adapting it to include cocoa powder to make this chocolaty treat. Mel's recipe is actually a bit more restrained when it comes to sugar and butter so you might want to check that out. Just like a regular Dutch baby, the lovely thing about this is the texture...crisp edges and a soft, thicker, custard-like center. While we savor the eggy, sweet vanilla flavors of a regular Dutch baby, this chocolate version is like having a light chocolate cake-pancake. You can embellish it however you like; I served mine with a spoonful of freshly whipped cream, a handful of fresh raspberries, and a dusting of confectioners' sugar. It was a wonderful treat that my family and I were happy to polished off in no time. A chocolate Dutch baby pancake is definitely worth trying if you love a good Dutch baby pancake. We are pretty devoted to the regular version but a chocolate Dutch baby is a great addition to the rotation, and it is a serious treat! It's worthy of Christmas morning breakfast, weekend brunch, or a date night dessert. Since my next post will likely be in the New Year, I want to take a moment to wish you a very happy holiday! I hope the next couple of weeks are filled with happy moments - time with loved ones, enjoying great company and delicious food! Here's to good healthy, peace, kindness, and joy in the New Year! Place flour, cocoa powder, sugar, and salt into a blender and pulse (or stir together with a spoon or fork) to combine. In a large measuring cup, beat the eggs, milk, and vanilla together with a fork, then add mixture into the blender. Process until smooth and frothy, scraping down the sides of the blender once. Let batter sit (about 20 minutes) while preheating the oven to 425 degrees. Place butter into a 10-inch cast iron or other skillet. Place into the hot oven to melt. Once the butter is melted, use oven mitts and very carefully (skillet is extremely hot) remove the skillet from the oven and give the pan a swirl to coat the bottom of the pan. Pour batter into the skillet and carefully return it to the oven. Bake until puffed, about 20 minutes. Carefully remove the pancake from the oven and serve immediately with your preference of accompaniments. I love the crisp edges! It looks fantastic, Monica. You too have a wonderful holiday! Hello dear Monica. 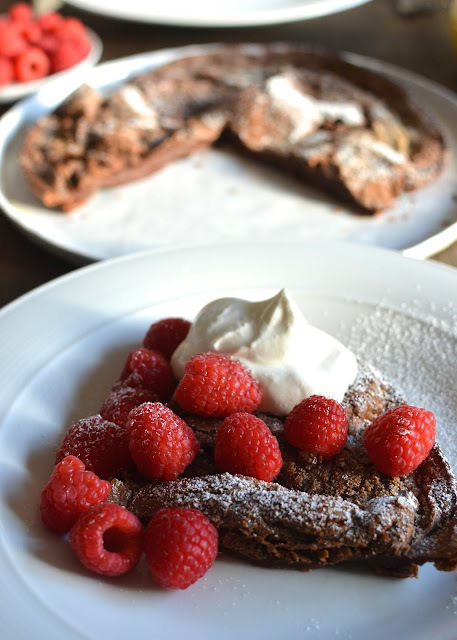 This chocolate Dutch baby pancake with raspberries looks tasty. I'm sorry to learn you've been sick lately. Thank God, you are fine now. It's nice to renovate the kitchen - a beautiful and well equipped kitchen - no longer makes you want to get out of there.... hahaha. Anyway, congratulations for all the recipes and I want to tell you that I am happy to have stumbled across your blog a year ago. Merry Christmas Monica. I look forward to reading your next posts, as soon as you return. Thank you so much for your lovely comment! I am so glad we got to connect in this way. Your kind words and encouragement have been much appreciated and I return all your compliments! Your blog is always a fun place...love looking at all the pastries and food, as well as the travel logs, book recommendations, and general lifestyle posts. Looking forward to all the fun and inspiration you'll share with us in 2017! Merry Christmas!!! So very, very pretty Monica! I know it has to taste out of this world delicious, too. This shall be my breakfast soon one day. Thank you so much. We love the regular Dutch baby but how can a chocolate version be bad. It's not! : ) Happy holidays and hope 2017 is the best yet. Yes, we share a love of Dutch babies and I see it all the time on instagram and such now...glad everyone is loving them. I had to try the chocolate and it went down easy. Have a great holiday and here's to a super 2017! How pretty and and delicious this dutch baby pancake looks. I bet i tasted divine. Merry Christmas Monica. You have a lovely holiday. It was very easy to eat! Happy Holidays to you and your family, too! I had a dutch baby for the first time about a year ago at a friend's house and fell in love! Butttt I keep forgetting to try making it myself! lol I need to change that ... especially with this chocolate version! Happy happy holidays Monica and I hope your kitchen is done very soon!! Dutch baby pancakes seem to be a love at first bite kind of a thing for almost everyone! We love it - especially my husband, who is very excited about me cooking up one again soon in a working kitchen. I can't wait either. The original is totally divine and this chocolate one doesn't hurt. Happy Holidays! Enjoy all the goodies and fun times with your family. Hi Monica, oh does this look like a perfect way to celebrate holiday mornings. Happy holidays to you and your family and I wish you the best with your kitchen makeover. Thank you so much, Cheri; I really appreciate it. Hope you and your family have a wonderful holiday celebration and may 2017 be a wonderful year for you! Hope you having a great holiday, Kelly! The kids must be so excited for Christmas morning! Hope you have a great break and enjoy every moment with the family. Congrats on your book this year and I wish you much happiness & success in 2017! Oh my gosh I love these! My husband and I have both been sick on and off since Thanksgiving as well. Hopefully we are both healthy by Christmas! It seems like these colds and viruses have been lingering! Hope you are all feeling much better, just in time to enjoy the holidays! Have a great one!! LOL! I'm glad we're on the same page. : ) We're much better for the most part - thank you! Have a great holiday and 'see' you in the New Year! What a decadent and delicious breakfast for the holidays! Who wouldn't LOVE these pancakes! Merry Christmas to you and your family Monica. Hope you have a wonderful holiday. Thanks so much and same to you and your family! Thank you so much, Adina. Merry Christmas to you and your family. Let there be plenty of great meals and much happiness and good health to you and yours in '17! I wish I could grab this piece and enjoy it! Looks absolutely mouthwatering! Happy Christmas and Joy in your hearts! Thank you very much! Love and happiness to you and yours as well! I hope you had a wonderful Christmas with your family and wish you a healthy New Year. Thank you, Karen. Same to you! Your Dutch baby sounds lovely! Hope the renovation continues to go well. And despite the reno and the sickness, I hope you had a wonderful Christmas. Can't stop Christmas from being great as long as the family is together and well. Thanks, Beth. Happy New Year!! Dear Monica! What I wish for you, is to believe that 2017 will bring you "the best." Let not lose hope - that is the force that moves us - and be able to always be happy with the less good things, believing that the beginning of a new year allows us to believe that anything is possible. You are so right...we must always have hope and I keep reading quotes and things telling us to be the 'good' or the 'change' that we want to see in the world. It's very true; we have to live with good intentions, good actions, and with hope and light. Here's to a wonderful 2017 for us all! Winter is so full of viruses! I was sick through New Year and my son before me! I love these pancakes and I wish Happy New Year to you and your family! We can totally relate to you here! Thank you and here's to a very fabulous New Year to you and yours! !